What Does an EMT/Paramedic Do? Anyone who suddenly becomes ill or is injured must receive medical treatment immediately. Emergency Medical Technicians (EMT) or paramedics are trained to administer on-site emergency care. They assess the patient's injuries or illness, provide emergency treatment, and transport the patient to a medical facility for further treatment. There were approximately 248,000 EMTs and paramedics working in the U.S. in 2016. Roughly half were employed by ambulance services, with another quarter in local government. About 18 percent in state and local hospitals. Verify that the assigned ambulance is mechanically sound and properly equipped at the start of a shift. Evaluate the nature and acuity of the illness or injury. Provide medical care and transportation for patients. Foster and maintain professional relationships with other providers, staff, and patients. Communicate with dispatchers via two-way radio. Navigate to incidents using maps and mobile data terminals. Complete Patient Care Transport Reports completely and thoroughly. Maintain familiarity with emergency and pre-hospital medical care by constantly keeping up to date with the latest practices. 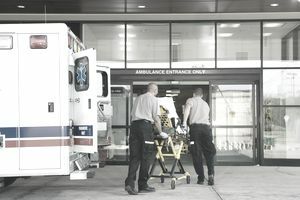 An EMT/paramedic's pay can depend somewhat on geographic location and employer, whether they work in the government sector or for a private employer. Although education requirements aren't necessarily stringent, training and licensing requirements can be more of a challenge. Education: You'll need at least a high school diploma before beginning training to become an EMT. Paramedics' training can include an associate degree. Training: There are three levels of training for those who want to work in this field: EMT-Basic, EMT-Intermediate, and Paramedic. Coursework at the EMT-Basic level consists of emergency skills and patient assessment. Students being trained at the EMT-Intermediate level learn how to use advanced airway devices and administer intravenous fluids and some medications. Paramedics receive the most advanced training which may result in an associate degree. The coursework at this level includes anatomy, physiology and advanced medical skills. Licensure: You must be licensed to work as an EMT or paramedic. Requirements vary by state, but most states require EMTs and paramedics to pass the National Registry of Emergency Medical Technicians NREMT exam. Generally, licenses must be renewed every two to three years. Certification: Some states have their own certification exams which EMTs and paramedics must pass to practice. You can learn more about licensing requirements in your state using ​Licensed Occupations Tool at CareerOneStop. In addition to formal training and a license, you'll also need certain soft skills and personal qualities to succeed in this occupation. Strong critical thinking and problem-solving skills: These allow an EMT or paramedic to quickly evaluate various solutions to problems to choose the one that has the best chance of resulting in a positive outcome. Excellent listening and speaking skills: Topnotch communication skills let the EMT or paramedic receive information from and convey it to the patient and others on the scene. Physical stamina: This job requires a lot of lifting and bending, so you must be physically fit. The U.S. Bureau of Labor Statistics predicts that employment for EMTs and paramedics will grow much faster than the national average for all occupations through 2026. Job growth is expected to be at about 15 percent because events like natural disasters and manmade emergencies aren't likely to decrease, and some emergencies can be expected to increase as America's population ages. Make no mistake, this job can be dangerous. Paramedics can be routinely exposed to disease, including hepatitis and HIV, and they risk injury. Patients under the influence of drugs or alcohol, or who suffer from mental disabilities, can become violent and be resistant to help. Following proper procedures help, however, such as waiting for police intervention in highly volatile situations and wearing protective gear. Jobs are typically full time and may also include overtime. Emergencies happen around the clock, so EMTs' and paramedics' schedules can include nights, weekends and holidays. Shift work is common so that staff is available around the clock. About one-third of paramedics and EMTs routinely worked more than 40 hours a week in 2016. Some work 12- or 24-hour shifts with long stretches of time off in between. Some careers involve serving the public in a similar capacity.